Arenal Volcano is a conical stratovolcano that stands on the shore of Lake Arenal in northwestern Costa Rica. It is the youngest and most active volcano in the country, and has been in near-constant eruption since 1968. Image copyright iStockphoto / M. Gabrenya. Arenal Volcano, the youngest stratovolcano in Costa Rica, is one of the most active volcanoes in that country and in the world. It has been producing lava and pyroclastic flows almost continuously since 1968; this activity has been both a hazard to people living near the volcano and a draw for thousands of tourists over the years. Located on the eastern shore of Lake Arenal in northwestern Costa Rica, Volcán Arenal was thought to be extinct prior to the eruptions of 1968, although it is now known that eruptions have occurred on and off for the last 7,000 years. Map of Costa Rica volcanoes: Map showing the location of Arenal Volcano in northcentral Costa Rica. Line A-B marks the location of the plate tectonics cross-section shown below. Map by Geology.com and MapResources. 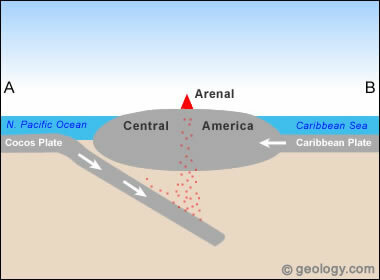 Plate tectonics of Arenal Volcano: Simplified plate tectonics cross-section for Costa Rica and Arenal Volcano. The volcanic arc of Costa Rica, where Arenal is located, is a chain of mountains resulting from the subduction of the Cocos tectonic plate under the Caribbean Plate. Costa Rica is part of the Central American isthmus, which connects the North and South American continents. Volcanoes are mostly confined to a NW-SE trending strip in the northern part of Costa Rica because the Cocos plate subducts at a very steep angle there, and because the Cocos Ridge disrupts normal subduction to the southeast. Arenal is located northwest of the Chato volcanic complex, which last erupted about 4,000 years ago. Arenal is a young volcano at about 7,000 years old, and is still in the process of building its 1,670 m (5,479 foot) cone by alternating periods of major explosive eruptions with lava flows that stabilize the loose material on its cone. Its rock is mainly basaltic andesite, and is erupted in the form of slow-moving lava flows, Strombolian and Vulcanian tephra, and pyroclastic flows resulting from the collapse of lava flow fronts and Plinian eruption columns. There are a number of hazards associated with Arenal. Because it experiences Strombolian and Vulcanian eruptions, tephra (including ash, scoria and ballistic blocks) are often thrown from the active vents, and can be deadly if large enough fragments strike people, animals or structures. Plinian eruption columns are even more dangerous, since they can drop ash on local towns and produce pyroclastic flows that could travel beyond the flanks of the volcano into populated areas. Pyroclastic activity caused some of the deaths in the 1968 eruption of Arenal, and the 40th anniversary of this event was recently commemorated with parades and other events in towns around the base of the volcano. Arenal Eruption: Vulcanian explosive eruption from one of the summit craters of Arenal Volcano. Image copyright iStockphoto / H. Gossmann. -- Ballistic blocks from the 1968 eruption may have traveled as fast as 400 meters per second - more than 800 miles per hour! -- Arenal is popular not only for its eruptions, which draw thousands of people to the Parque Nacional Volcán Arenal each year, but for its hot springs, which occur in a ring around the base of the volcano. Many of these springs have been developed into elaborate themed baths, with water piped into a variety of decorated pools, but other more natural springs are still popular with local residents. The earliest known eruptions of Arenal began around 7,000 years ago, breaking through older volcanic tuffs and sedimentary rocks. Plinian eruptions occurred about every 1,000 years, interspersed with lava flow and pyroclastic activity and periods of quiescence, and built Arenal into a classic stratovolcano. Before 1968, the most recent eruption occurred 520 years BP, although it does not appear in any recorded or oral histories, and people assumed that the volcano was extinct. In the summer of 1968, people living near the volcano noticed that the temperatures of hot springs around the volcano were increasing, and noticeable fumarolic activity began appearing on the volcano. The eruption began on July 29 when three vents opened on Arenal's west flank and began producing Vulcanian explosions. Ballistic blocks, tephra and hot gases killed more than 70 people in the villages of Tabacón, San Luís and Pueblo Nuevo, and a directed blast on July 31 killed another 8 people in the Tabacón river valley. The Vulcanian eruptions produced numerous Plinian columns, some of which reached 10 km (6.2 miles) in height. Arenal has been almost continuously active since the 1968 eruption, extruding basaltic andesite lava flows, Strombolian and occasional Vulcanian explosions from the summit craters, and pyroclastic flows from the collapsing fronts of the lava flows. Fumaroles on the summit and flanks continue to emit gases, and there are numerous hot springs ringing the base of the volcano. Although lava flows have traveled beyond the base of the volcano, pyroclastic flows tend to be confined to valleys on the volcano's flanks, and have not had significant impacts on people living near the volcano since the 1968 eruption. 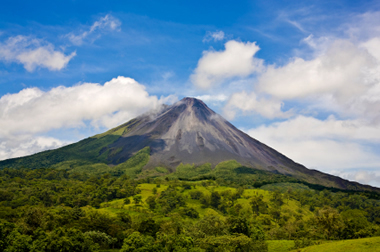 Because Arenal is so active, tourism is a major source of income for the region, and the area around the volcano has been made into a national park. Alvarado, G.E. 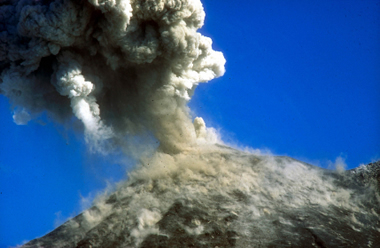 et al., 2006, The 1968 andesitic lateral blast eruption at Arenal Volcano, Costa Rica. Journal of Volcanology and Geothermal Research, v. 157, p. 9-33. Cole, P.D. et al., 2005, Explosive activity and generation mechanisms of pyroclastic flows at Arenal volcano, Costa Rica between 1987 and 2001. Bulletin of Volcanology, v. 67, p. 695-716. Observatorio Vulcanologico Sismologica de Costa Rica-Universidad Nacional (OVSICORI-UNA). Smithsonian Institution Global Volcanism Program Website. Soto, G.J. & Alvarado, G.E., 2006, Eruptive history of Arenal Volcano, Costa Rica, 7 ka to present. Journal of Volcanology and Geothermal Research, v. 157, p. 254-269.